And, with the flip of a calendar—the holidays are in full swing. From cookie baking to watching the ball drop, there’s no shortage of occasions that require you to dress up (or down!) So, we asked our Stylists what they’d be wearing—because they always have answers to our pressing fashion needs. Here’s what they had to say! Keep scrolling to see our Stylists’ holiday looks! 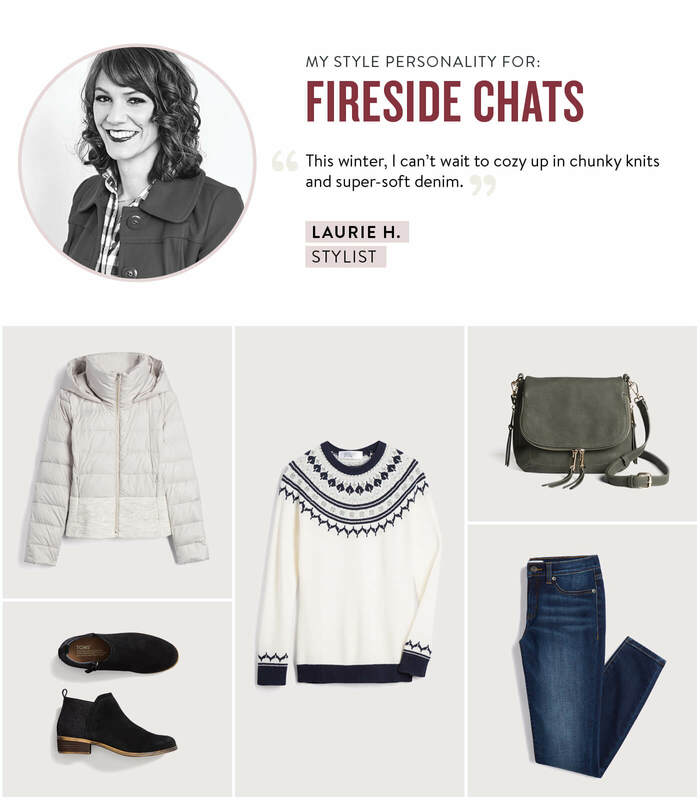 “I can’t wait to cozy up in chunky knit turtlenecks & super soft denim.” — Stylist Laurie H.
A word to the wise: If you have to head outside, reach for a cozy puffer jacket, wool socks, a scarf and your warmest boots to stay stylish and warm! “My go-to outfit before the clock strikes midnight? 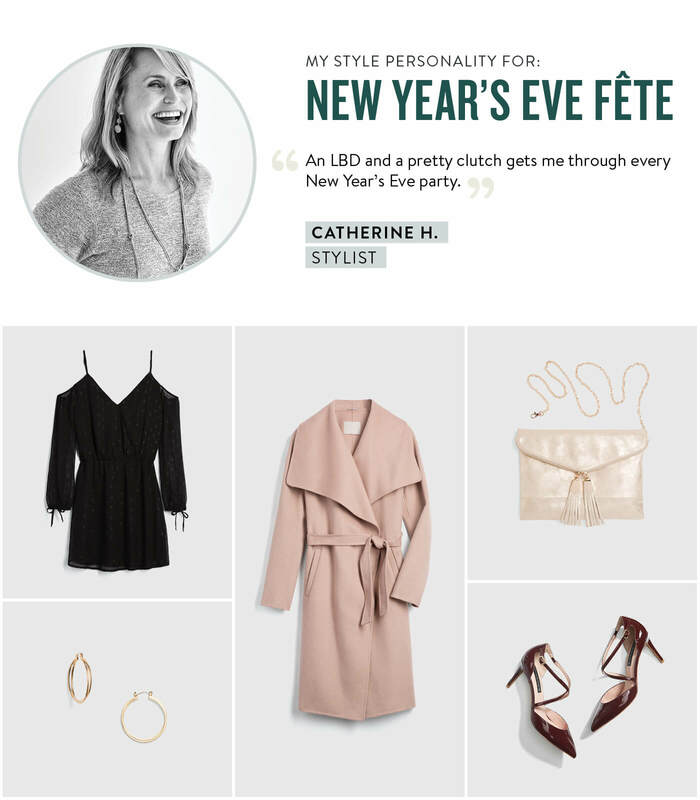 An LBD and a pretty clutch gets me through every New Year’s Eve party.” — Stylist Catherine H.
“I love the holiday season and the holiday parties that come with it,” says Stylist Catherine H. “When the invitations roll in, I have my go-to ensemble at the ready: An A-line dress, a small clutch for party essentials and a pair of sky-high heels.” The cherry on top of any holiday outfit? Catherine suggests reaching for an over-the-top statement piece like a necklace, bangle or chandelier earrings as your stylish exclamation point! Whether it’s casual or dressy, a family dinner should be relaxed. 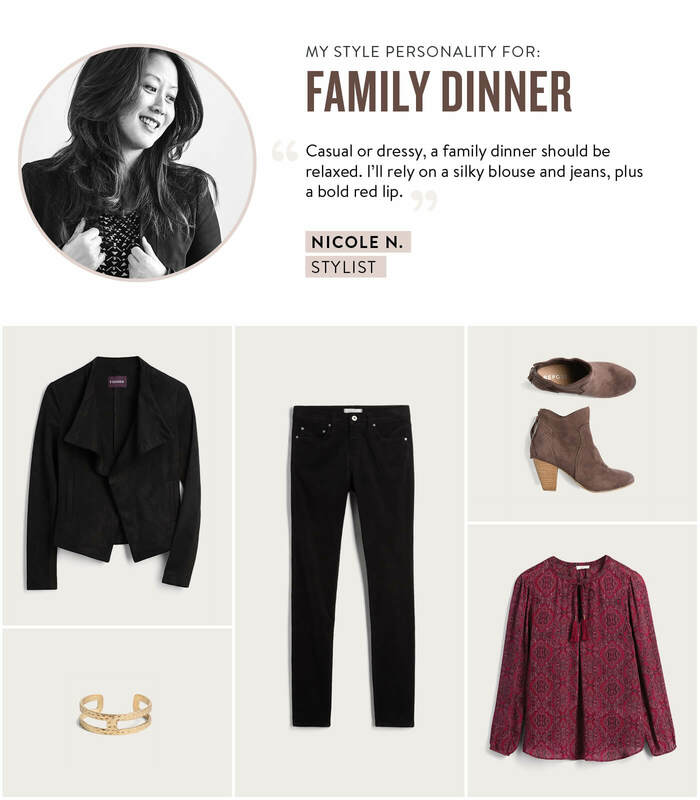 I always rely on a silky blouse and chic trousers—plus a bold lip.” — Stylist Nicole N.
“As a new mom, I’m looking forward to my family’s holiday dinner party,” says Stylist Nicole N. Aside from topping off her look with some embellishments, she tells us, “I’m all about textures, so I’m thinking about suede, velvet and soft silks.” This season, Nicole suggests adding in textures that you don’t normally reach for to add just a touch of glam. Plus, bringing a bottle of champagne to celebrate! 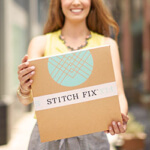 What will you be wearing this holiday season? Tell us!